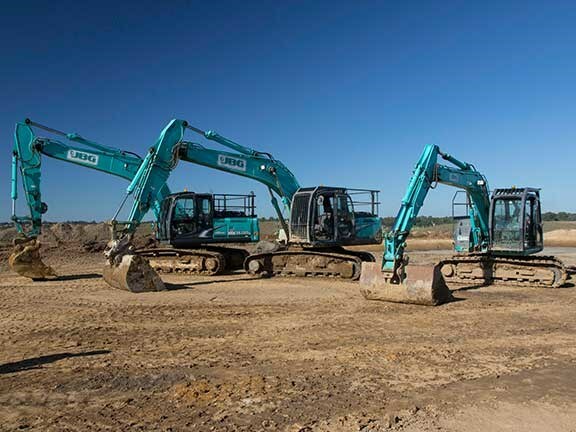 New South Wales’ JGB Contractors runs a fleet of Kobelco machinery and says they’re key to winning major contracts. JGB Contractors has been operating out of the Wollongong area for more than 20 years and has performed civil works, quarrying, demolition and asbestos removal from Sydney to the far south coast of NSW. The company currently maintains a fleet of 15 excavators covering the mini, midi and large models. JGB has been using Kobelcos for around 10 years and says their adoption of the brand has been a big part of its success. "Taking advantage of Kobelco's fuel efficient and reliable machines has enabled us to rapidly deliver large-scale projects, like upgrades to the University of Wollongong and some major government projects across the state," JGB manager Budd Green says. "We make a point of ensuring that all of our equipment is modern with the latest safety and technological features on board to comply with all major project specifications." JGB purchased its first Kobelco excavator back in 2006 from local Wollongong distributor South Coast Trucks and Machinery and has maintained a working relationship with them ever since. "At the time, we were expanding the business as we were getting more and more work, but we had been having difficulty getting machines serviced promptly," Green says. "We approached South Coast Trucks and Machinery, our local Kobelco dealer, and were really happy with the initial purchase time, back up and support given and it’s been consistent ever since." "We have to stay competitive, and that means we can’t afford downtime. Our collaboration with Kobelco means serviceability isn’t an issue. They put the effort into looking after us and so we keep coming back."